Delayed Remote: After you press the shutter-release button on the remote unit, the AF-assist lamp blinks for about two seconds, and then the camera takes the picture. Quick Response Remote: The image is captured immediately. In this mode, the AF-assist lamp blinks after the shot is taken. After choosing the remote setting you want to use, aim the remote control at one of the camera’s two infrared sensors. One is located on the back of the camera; the other, on the front. This figure points out both sensors. Normally, the camera cancels out of the remote control modes if it doesn’t receive a signal from the remote after about one minute. 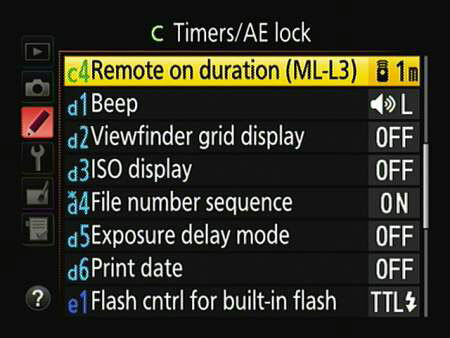 You can adjust this timing through the Remote On Duration option, located on the Timers/AE Lock submenu of the Custom Setting menu and shown in this figure. The maximum delay time is 15 minutes; keep in mind that a shorter delay time saves battery life. After the delay time expires, the camera resets itself to either Single Frame, Quiet, or Continuous Low or Continuous High mode, depending on which mode you last used. The Release mode is also reset to one of those modes if you turn the camera off. These Release modes are not meant to be used with a remote control that you attach to the camera via the Accessory port (found under the cover on the side of the camera). Select one of the normal Release mode settings and then press the shutter-release button on the remote to trigger the shutter. See your remote’s operating guide for details. One final note: As with self-timer shooting, it’s a good idea to cover the viewfinder when you’re using these modes to prevent exposure problems that can be caused by light entering the camera through the viewfinder. The best option is to replace the rubber eyepiece that surrounds the viewfinder with the viewfinder cover that ships with the camera.